The Trussell-Winchester adobe, at 414 West Montecito Street, stands as an architectural embodiment of a transitional period in Santa Barbara history. Built in 1854, the date of its completion is on the cusp of the city’s passage from Mexican pueblo to American town. Horatio Gates Trussell, like so many Americans who arrived in Santa Barbara in the mid-1800s, was a New Englander. Born in Maine in 1808, as a young man he turned to the life of the sea. He rose steadily through the ranks until he commanded a ship of his own. As he worked in the merchantman trade between the East Coast ports, primarily Boston, and the ports of California and Hawaii, he became familiar with the California ports of call including Santa Barbara. It was during one of his stops here that he met Ramona Eayrs-Burke and vowed to marry her. Ramona also had a link to the ocean; her great grandfather was George Stewart, a sailor on the famous H.M.S. Bounty. Trussell made good on his promise when he retired from his seafaring life and married Ramona in 1851. Trussell was 42 at the time, the bride was 16. Ramona’s stepfather was Isaac Sparks. He had come to California in 1832 and was a successful otter hunter, merchant, and rancher. He was also prominent in city politics. It was to him that the Trussells turned when they were looking for land upon which to build a house. Sparks obliged, deeding the couple property near the present-day corner of West Montecito and Castillo streets. By the end of 1854, Trussell had completed his hybrid adobe home. Although the primary structure consisted of adobe, the traditional building material of Spanish and Mexican California, Trussell also added a wooden porch and a combined storage and entry room made of wood. 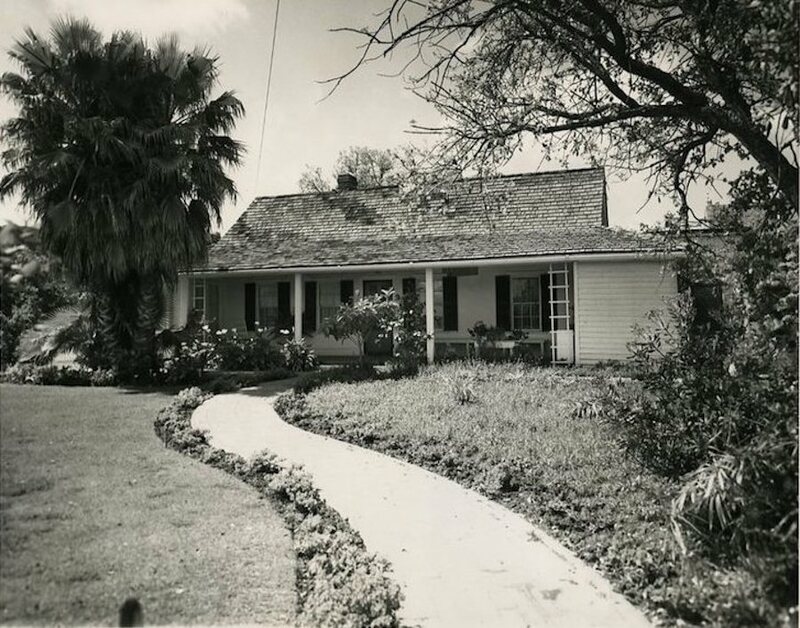 The house also had one of the first roofs in Santa Barbara made of wooden shingles, instead of tiles. Reportedly, he used a number of timbers in the roof and floor that he salvaged from the Winfield Scott, shipwrecked at Anacapa Island late in 1853. The Trussells lived in the adobe, along with a growing family that eventually included ten children, until 1869, when Trussell built a two-story house nearby. In 1878, the adobe passed out of the hands of the Trussells and into those of William M. Eddy, a prosperous banker, who probably bought the house as a real estate venture. It is unclear exactly what use Eddy put to his new purchase; what is clear is that in the summer of 1882 he sold it to the Uriah Winchester family. The Winchesters were also from Maine and arrived here in 1869. Among the three remaining children was Robert, who had become a doctor and, in the early 1870s became the personal physician of W. W. Hollister. The youngest, Charlotte, was married to Stanley Bagg, who for a time was owner of the famous Tombstone Epitaph newspaper in Arizona. The Winchesters added a bedroom to the house, enlarged the main bedroom, and probably added the sun porch to the east side of the home. The family began to sell bits and pieces of the property in the mid-1920s and by the end of the decade the tract belonged to John and Katherine Hastings, the latter being the daughter of Charlotte. With Katherine’s death in 1955, the property came into the possession of the Santa Barbara Historical Society, which, in accordance with her wishes have preserved the adobe and with it an important slice of local history. This article originally appeared in the Santa Barbara Independent. Santa Barbara: The Walnut Capital of the U.S.